Chinese manufacturers have been making headlines in the smartphone industry by providing low cost devices with impressive features. To keep up with the smartwatch hype the company No.1 has released the S3 smartwatch and claims to be the first of it’s kind to use a micro SIM card. This cool feature transforms the smartwatch from a simple remote control for a phone to a perfectly usable talking and texting device. Last week I used this smartwatch as a replacement for my mobile phone to see how practical it can be in real life situations. The box comes with the No.1 S3 smartwatch, user’s manual, charging cradle with 5 pins and a USB- microUSB data cable. The cable is also used to charge it from a USB power source. From an aesthetic point of view the smartwatch looks gorgeous, it has a round 1.22 inch capacitive screen display, similar to the Motorola Moto 360. The case is made of stainless steel, a power button sits on the upper right side, the microphone is placed on the lower left side and it has an elegant leather strap. One of the straps houses the heart rate sensor. The back of the watch is a bit of a let down, it’s back side is a plastic cap the feels brittle. I was a bit worried that it would crack when I opened it, but with a bit of care I took the cap off and on several times without damaging it. At the back of the S3 smartwatch there are 5 little golden connectors where the pins from the cradle make contact in order to charge or transfer data. The No.1 S3 smartwatch is powered by a 350 mAh battery and behind it there are 2 slots, one for the micro SD card and the other for the micro SIM card. The watch is light, weighing only 53 g.
The watch powers on in about 12 seconds. After the home screen appeared it had an analog clock display and I noticed that 5 mm are missing from the bottom of the display, there is no image below the 16:30 hour mark. I think that they needed that space for the internal hardware. From the home screen the apps menu can be opened by pushing the power button or swiping the screen in any direction. There are 7 screens that you can scroll through by swiping left or right, each showing 4 apps and to go back to the home screen you simply swipe up or down. Swiping up or down from the home screen will open the apps menu. The smartwatch comes with an impressive batch of features and apps with the possibility to install more. The most important is the Bluetooth connection that allows the user to sync with a mobile device and control it from the watch. The watch can be personalized from the settings menu, you can change the background image, sounds, adjust the time and date, the style of the home screen and many others. The first thing I changed was the home screen, I switched from the analog clock face to the digital one so that the missing part of the screen is less obvious. Most of the apps that the smartwatch comes with are useful and fun to use. The motion sensor allows the user to control some functions of the device by flipping or shaking it. For example flipping the watch can silence a call or an alarm and shaking it can answer a call. It can also turn on the display when flipped so you can see the time or a notification just by turning your wrist like you would with a normal watch without having to press the power button. For those who like to have an active life style the No.1 S3 smartwatch has a menu screen with 4 sports oriented apps. There’s an app called pedometer in which the user inputs their height and weight, after that when the app is turned on it automatically counts the number of steps made and shows how many calories were burned. The heart monitor uses the sensor found on the inside of the strap to measure and show the number of beats per minute. Sedentary is a cool app that can be set in increments of 30 minutes to remind the user to do some simple exercises. This is useful for people who have a static job like working at a desc, and sitting in a chair for long periods of time. For helping users improve their sleep quality there is a sleep monitor app that lets you keep tabs of slept hours. For outdoor activities the smartwatch can measure the temperature and the intensity of the sun’s radiation. The watch features a few productivity apps like stopwatch, calendar, calculator, alarm and a camera app. The camera app controls the camera of a connected device via Bluetooth. For entertainment the smartwatch can be used to view pictures, watch videos or listen to music. These can be accessed from a synced device or from a micro SD card. The display offers a decent image, it’s not as sharp as I would have liked it, but for a device like this it’s ok. The speaker does a good job, when you go close to the maximum volume it distorts, but that is to be expected. With the volume set at 3 quarters the music sounds good, taking into consideration that this is not a dedicated sound device and the plastic back doesn’t help improve acoustics. The real interest in this gadget is the phone function. The No1. 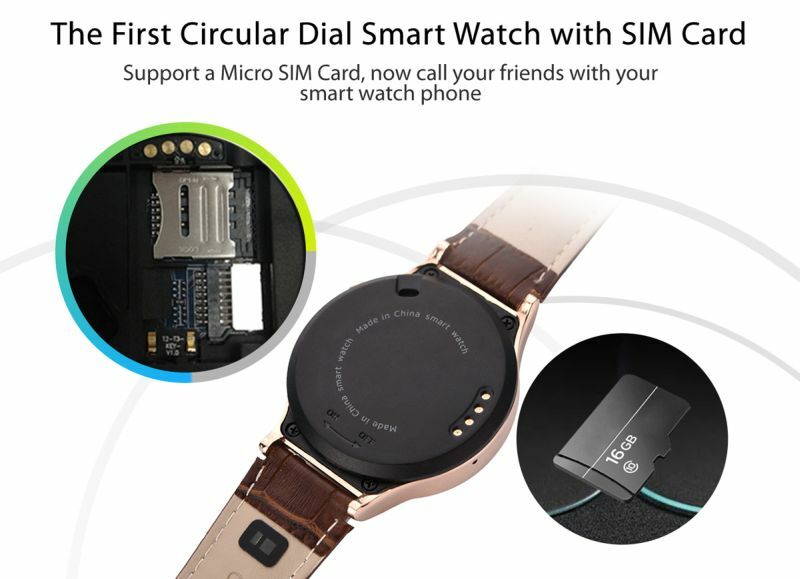 S3 smartwatch can show the contacts from the micro SIM card or the synced device, it stores and shows the phone log, it has a dialer and SMS function. Just like on a phone the SMS has inbox, outbox, draft, etc. Like the other phone functions the user can choose to see the messages stored on the SIM or the ones from another device. When writing a message a 12 key phone keyboard appears with 3 extra keys, for erasing, language input and to minimize the keyboard. Writing with it is a bit of a challenge, the surface of a key is pretty small and sometimes you have to press it 3 times to get the letter you want and the minimizing key is smaller than the rest and that makes it harder to touch, most of the times I touched the language input key that sits above. Using the smartwatch with a SIM card is an interesting experience, the only difficulty would be sending texts. Making or receiving calls is very easy, you can hear the person on the other end very clearly and talking into a watch give’s a sort of James Bond feel. Mostly I used it as a remote control for my phone, it’s a nice and comfortable way to see notifications, who’s calling, read a text or control the music player without having to pull out your phone. This is helpful for those who use large screen smartphones.. Another plus is that the watch vibrates so even if the ambient noise is loud you will feel it on wrist when you have a notification for a call, text or mail. I had no trouble getting through a full day of normal use with one charge in both situations, with SIM card or Bluetooth connection. Overall the No.1 S3 smartwatch is a nice gadget to have, it looks elegant, feels good on the wrist and it can be useful in many situations. Among the few downsides I will mention that the device is a bit slow, I could see a bit of lag when swiping through the app menu and the interaction is a bit rigid. Another aspect I didn't like, which I described earlier, is the missing part of the screen. It would have looked a lot better with a complete round display.